Some of the coolest bits of pop culture come out of the 1920s. Full of glitz and glamor, wild sights and late nights, historians nicknamed them the Roaring Twenties for a reason. There was the Lost Generation of writers who documented these years for our entertainment. Hemingway and Fitzgerald sitting at their typewriters, sipping champagne in some Parisian paradise, told us of flappers and dreamers and shady mob types. That trope stuck around and has become the subject of much noir. And that noir inspires the imagination in all of us, even to this day. Even your little one! Sleek and mysterious, no one will make the mistake of messing with this budding crime boss (or his hat!). 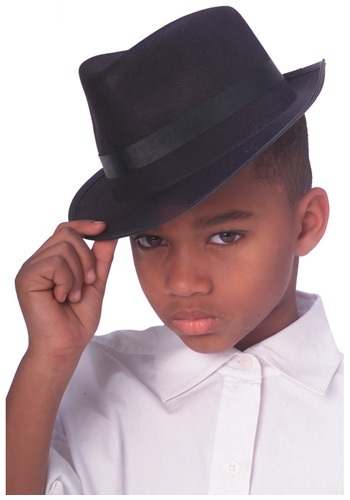 Show that you really mean business with this Child Gangster Fedora Hat. Just... please remember to take it off in the presence of a lady. Just because you're a gangster doesn't mean you can't still have a few manners.